In our experience both as homeowners and as sealant manufacturers, we have found that many people know very little about sealants and silicones. We wrote this guide to help homeowners to be more informed on silicones and sealants, and to help them make better choices. This is a good thing for us, because we find that homeowners are willing to spend a little more on better-quality products that last longer (like our products). Contractors, on the other hand, want to save on costs. If homeowners are ill-informed, contractors will use any sealant they like (usually the cheapest). Having informed homeowners help the industry move to a higher overall quality. In this guide, we’ll go through the economics, the basics, and some technical details. Sealants are almost never a discussion point for most homeowners in Singapore due to the lack of pertinent information, and because it is such a small percentage of any renovation work. There are guides to floorings, lightings, plumbing, carpentry, and most other large components of a building, but sealants? Not many people think about it. People don’t think about it when they’re planning their renovation and speaking with their contractors and interior designers. Good contractors will provide a detailed list of materials they will use in their construction, such as brand and type of tiles and vinyl, or even brand of cement screed. Sealants are almost never on the list. People only think about sealants when they start growing mouldy, or peeling off. It then becomes an eyesore. Being in the sealant industry, we think this should change, most importantly because it helps to drive our sales (our products are high-quality and relatively more expensive), and because we think every homeowner should make the best choice for their own homes in the long-term. What we suggest is simple – ask your interior designer or contractor what brand and type of sealant they intend to use in your home. Especially in the most critical areas – bathrooms and kitchens. Then, do some research on their choice. If that brand has no presence online, good luck. Lastly, and most importantly – specify exactly what brand and type of sealant you want them to use (obviously, we’d recommend our Pereseal range, in particular Pereseal AF Bathroom and Kitchen Silicone Sealant). It’s such a small fraction of cost of the total construction that we doubt contractors would bother adjusting their pricing to you. Even poor quality sealants can last a while, perhaps 1.5 years. Most homeowners won’t ask the contractor to fix a sealant applied 1.5 years ago. Let’s say a 5-room BTO HDB flat renovation costs SGD 50,000. How much sealants would they use? 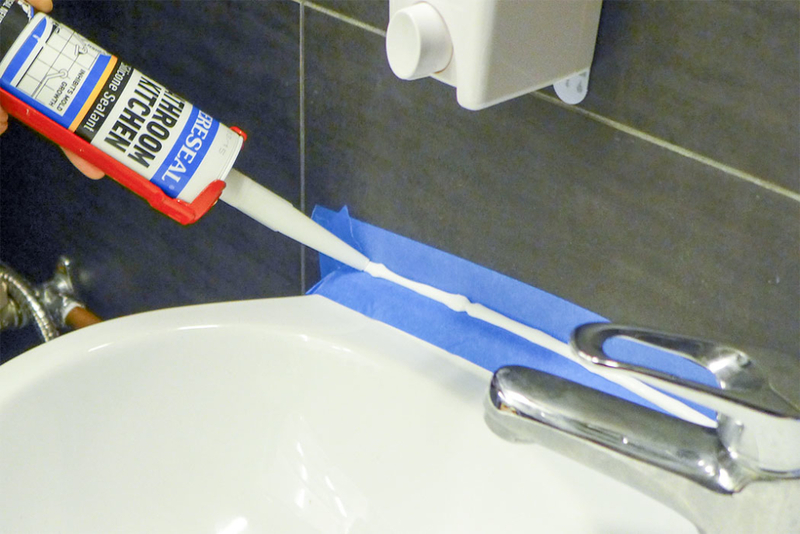 Assuming 20 cartridges (which is quite high), we’re talking about $98 for our top-quality, sanitary grade, undiluted silicone sealant, Pereseal AF Bathroom and Kitchen Sealant. This is calculated with our online shop price of $4.90 per cartridge. The percentage? 0.2%. Assuming a contractor wants to cut corners and buy cheaper material, and uses a poor grade silicone sealant at $2.50 per cartridge. The total will then be $50, which means a savings of $48 to the contractor, for a project total worth $50,000. Here is where we ask homeowners – would you pay that extra $48 to ensure that your contractor will use a good sealant? This means a sealant that lasts longer (e.g. 5 years instead of 1 year) before turning mouldy, or peeling off, or discoloring. Would you pay that extra $48 so that you won’t have to remove the old sealant and reapply a new sealant only 1.5 years down the road? See the following images for examples of common problems. You can click on them to enlarge them. You will find these problems on poor quality sealants after a while – it could be weeks, months, or years. You may also find these problems on high-quality sealants. The main difference is the length of time before this happens. The most common problem for homeowners – mould growth – can occur as quickly as two weeks in low-quality sealants. In contrast, our own home bathroom has a sanitary Pereseal sealant applied around 24 years ago. It only started growing mould in the 23rd year. Homeowners should insist on high-quality sealants suitable for the applications because the sealants can last longer before needing repairs or resealing. In many cases, this already justifies paying more for a higher quality sealant. As an illustration, imagine a poor sealant that costs $2.50 requiring resealing two years. A high quality sealant costing $5.00 requires resealing every 5 years. In ten years, you would have spent $12.50 on the poor sealant and $10 on the good one. This doesn’t even include cost of labour. 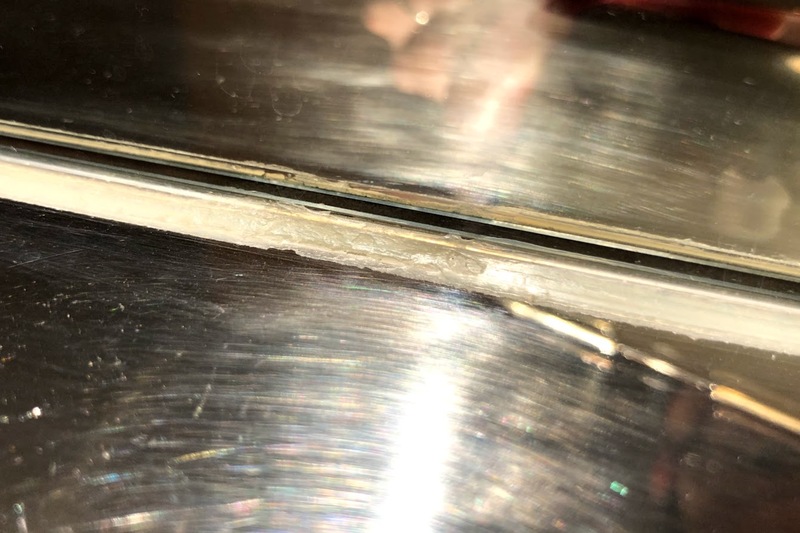 At any rate, homeowners should insist on high-quality sealants because sealant failures and mould growth are eyesores that are always visible, and which can be avoided (or delayed) by using better sealants. We started with the economics first, because that is of most interest to the homeowner. Now, we’ll go into some definitions and technical details, so the homeowner can be informed in how to specify sealants. What is a sealant? A sealant is, basically, a chemical used to seal gaps, joints, and spaces between assemblies. An assembly is two separate materials joined together (e.g. sink and counter). A sealant’s function is to form a protective barrier to prevent water, air, sweat, or other elements from penetrating the materials and substrates they are applied on. It must have elasticity to accommodate movements of materials (which are guaranteed in all buildings, however minimal) without splitting, cracking, or tearing. There is a huge misconception in the world (especially Singapore) that silicon equals sealant. We have to clear this up everyday, even to contractors. “Sealant” is the general and correct term for the chemical used to seal. “Silicone” is one type of sealant. There are also acrylic sealants, polyurethane sealants etc. Silicone sealants are the most prevalent type of sealant. [Note that silicones can also be used in other things, such as silicone gel pads and in plastic surgery – these are not called sealants]. “Silicon” is an element used in computers and processors. There are no silicon sealants, only silicone sealants. 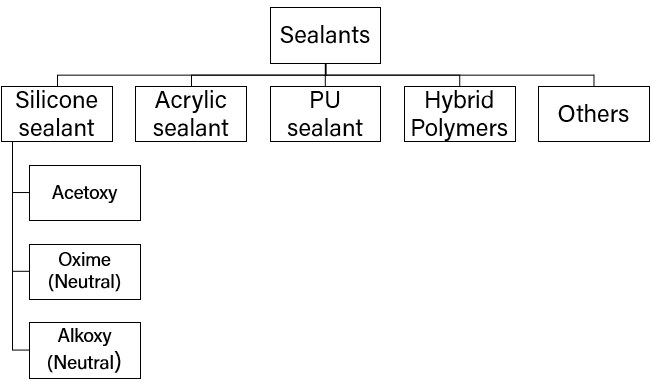 There are many, many types of sealants. The most common is silicone sealants, which explains why people end up calling all sealants “silicones” and “silicons”. Now, in most homes, you mostly only have to contend with two: silicone sealants and acrylic sealants. PU sealants are generally used in exterior construction, while hybrid polymers are usually too expensive for contractors to be used in homes. However, hybrid polymers can be a good proposition for the discerning home owner. Let’s go through them. Silicone sealants are the rubbery things you find at the edge of your sink. They are very versatile sealants which can be used in many applications, and excel when used on glass and metals. It is relatively affordable, and has good elasticity and general resistance. It’s easy to use and tool (smoothen), and has a nice appearance. However, it cannot be painted, and it has limited adhesion both in terms of strength and the substrates it can adhere to. Silicones can be further divided into different types. There are acetoxy silicones, oxime silicones, and alkoxy silicones (seldom used due to cost). Acetoxy silicones are distinctive by their smell during application – there is a strong acidic, vinegar smell. Oxime (or neutral) silicones do not have this smell. In general, oxime silicones are better in almost every aspect, including adhesive strength, suitability on different materials, and resistance. They are also more expensive. Silicone sealants can be diluted to make it cheaper. 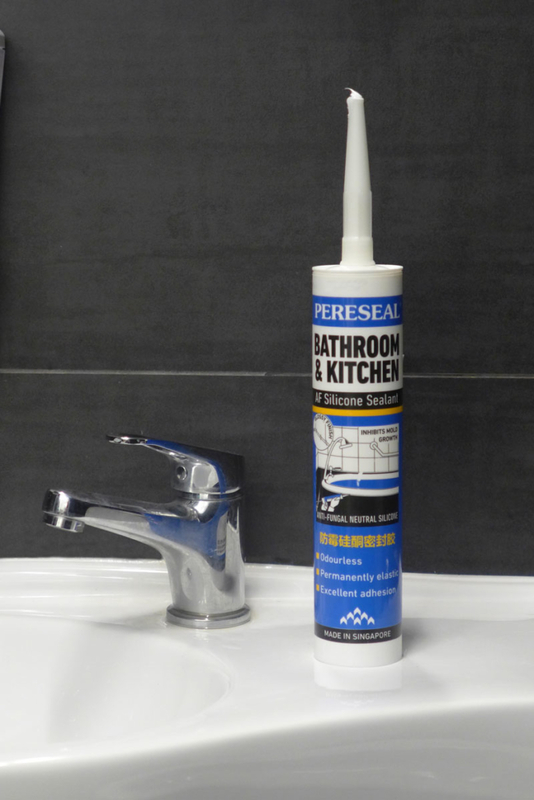 Making a 100% pure silicone sealant (like our Pereseal AF Bathroom & Kitchen Sealant) is very expensive, which is why most sealant brands will have a range of quality from cheapest to most expensive. The quality of a silicone sealant is largely dictated by how pure it is. In most applications, a 100% pure silicone is nice-to-have but not necessary; slightly diluted sealants can function very acceptably. However, for home-owners, we think that slight price premium of pure silicones is a small price to pay, especially when we’re talking about tens of dollars. However, be careful of sealants that are very diluted. Generally, highly filled silicone sealants are prone to cracking and turning brittle, and their adhesive strength is also not as good. They also tend to discolour. 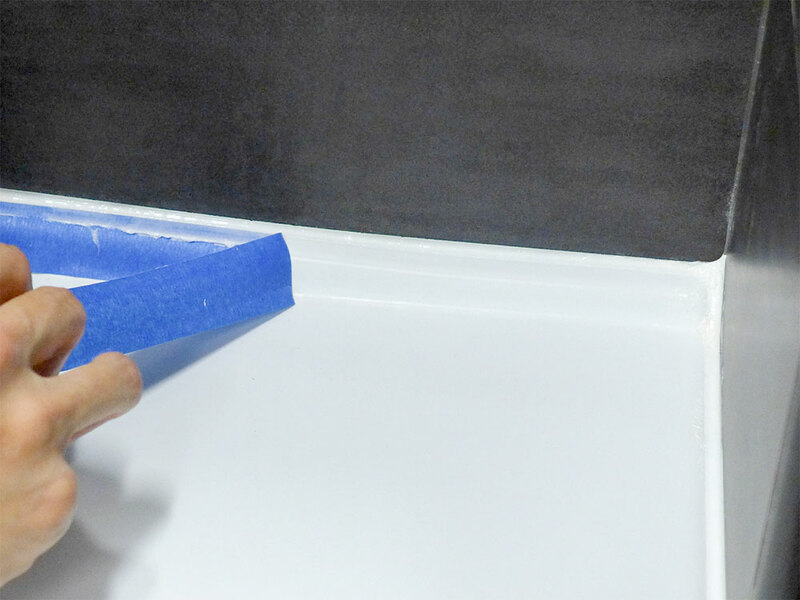 When used on slightly porous materials such as natural stone, marble, or granite (such as on counters), the plasticizers and other diluents in a diluted silicone sealant can migrate out of the sealant body and into the stone, discoloring it. 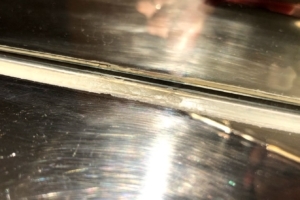 This is called leaching, and it is a common problem for cheaper silicone sealants. 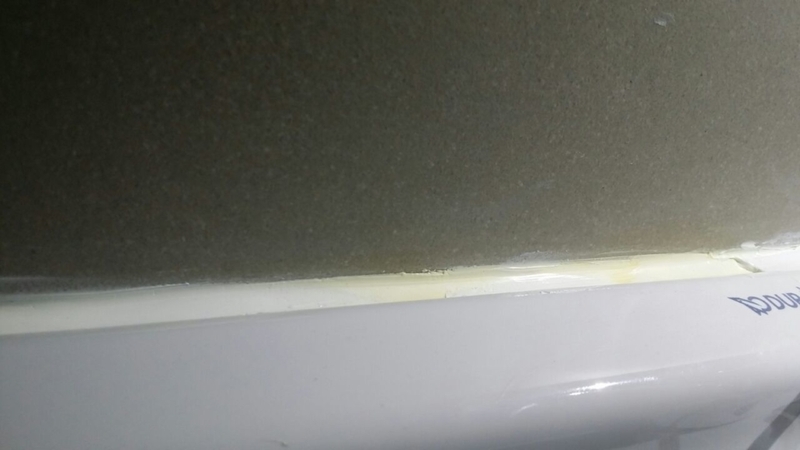 As silicone sealants are generally one of the better choices for use in bathrooms and kitchens, many sealants require anti-fungal and anti-mould properties. This can be achieved by the addition of chemicals to prevent mould growth, and are typically called sanitary sealants. We have heard people in the industry say that the acid in acetoxy silicones will kill fungal spores. This is NOT true. Silicone sealants do not have any natural resistance to fungal growth. Do not use a normal silicone sealant in your bathroom and kitchen – you could be looking at mould in as quickly as two weeks. Always ask for a sanitary grade, anti-fungal silicone such as our Pereseal AF Bathroom and Kitchen silicone. The quality and efficacy of the anti-fungal properties depend on formulations and the concentration of anti-fungal chemicals in the sealant. Not all anti-fungal sealants are the same. For example, our Pereseal AF is specifically formulated for use in hot and humid environments, and is used by many 5-star hotels in Singapore for its superior properties (such as The Regent and Four Seasons Hotel). It is also listed as a HDB Approved Material and has test reports confirming that Pereseal AF conforms to ISO 846 Sanitary Sealant standards. However, these anti-mould properties are not a substitute for regular cleaning of your bathrooms and joints. There is a lifespan to the sanitary properties. Generally, the dirtier a bathroom is, the shorter the lifespan will be. No sealant will stay 100% mould-free forever in a dirty environment. Areas that are always wet tend to grow mould. Try to keep the place dry. What homeowners should know is that the better a sanitary sealant, the longer it is before your sealant grows mould. The length of time can be as long as 20 years with a good anti-fungal sealant, in well-cleaned conditions. Also, if you are using countertops such as granite or quartz, we highly recommend using a non-staining silicone, usually of the 100% pure variety, such as our Pereseal AF. 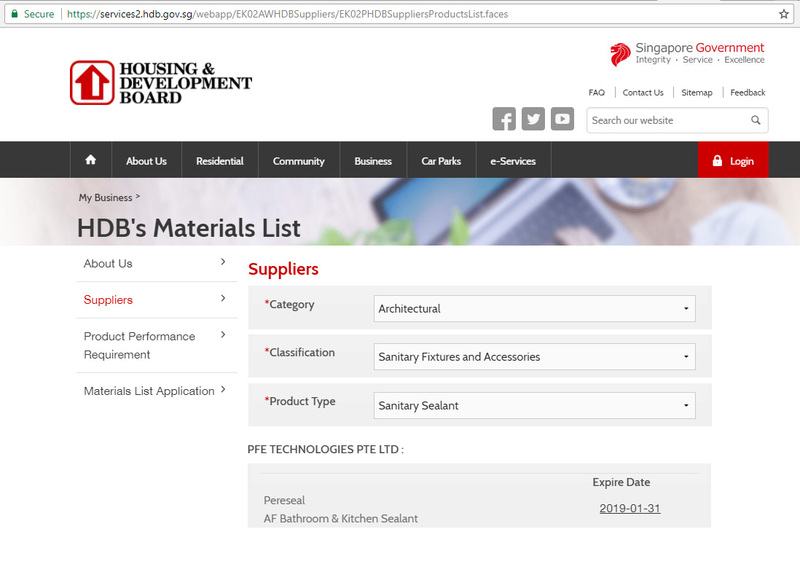 HDB has a list of approved construction materials. This list of materials is for the larger contractors building the whole blocks; not so much for the general contractor doing renovation works. This means that your contractor can use materials not on HDB’s list for your unit. Pereseal AF Bathroom and Kitchen sealant is listed in the HDB Approved Material List for Sanitary Sealant. 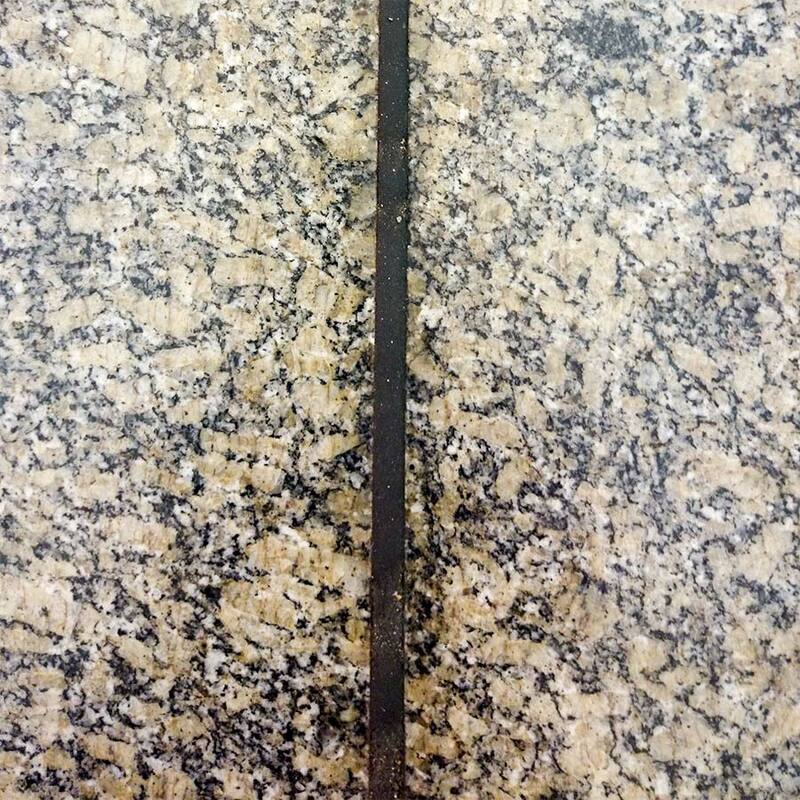 Acrylic sealants are sometimes called 泥土 (soil) by old-timer contractors due to its appearance as a putty. In fact, acrylic sealants were first sold in putty cans. It’s one of the older sealant technologies still finding its way into construction due to its versatility and low cost. It does not have the flexibility and appearance of a rubber like silicones; instead, acrylics look more like your wall, down to its matte appearance. Is it also paintable. For that reason, it is usually found on joints near the wall, such as on the floor skirting, door frames, and wall penetrations. Acrylic sealants are not fully elastic (they are plasto-elastomeric), and are not recommended to be used in applications with prolonged or constant contact with water. Two things to look out for in acrylic sealants is its shrinkage and cracking. As a water-based sealant, acrylic sealants will lose moisture during hardening and shrink. If it shrinks too much, it may crack after a while. Our Pereseal 702 High Performance Acrylic sealant has been used in countless construction projects for a reason – it’s been used for decades with no problems. Polyurethane (PU) sealants are mostly used in expansion joints for construction, which means they should not end up being used in your home. In almost every application, a hybrid polymer will easily outperform a PU sealant in any parameter. 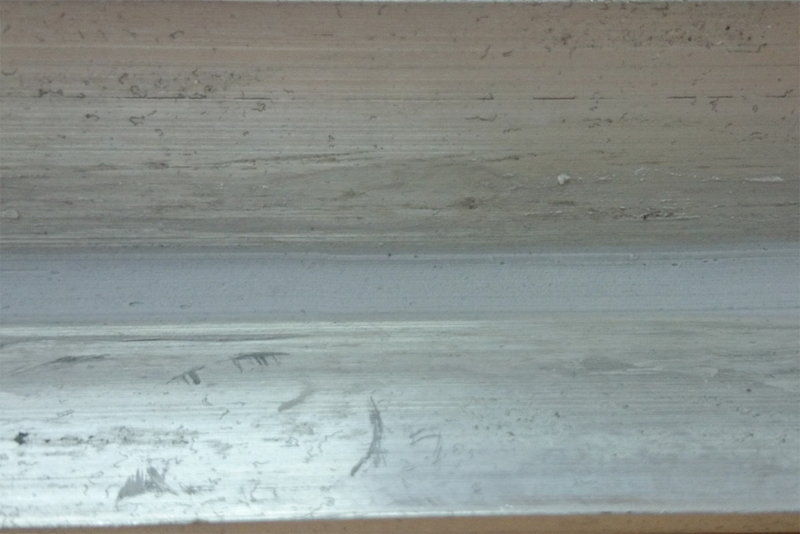 PU sealants may also be found between your window frame and wall. Our Soudal Fix All hybrid polymer sealants are jacks-of-all-trades and masters at all. 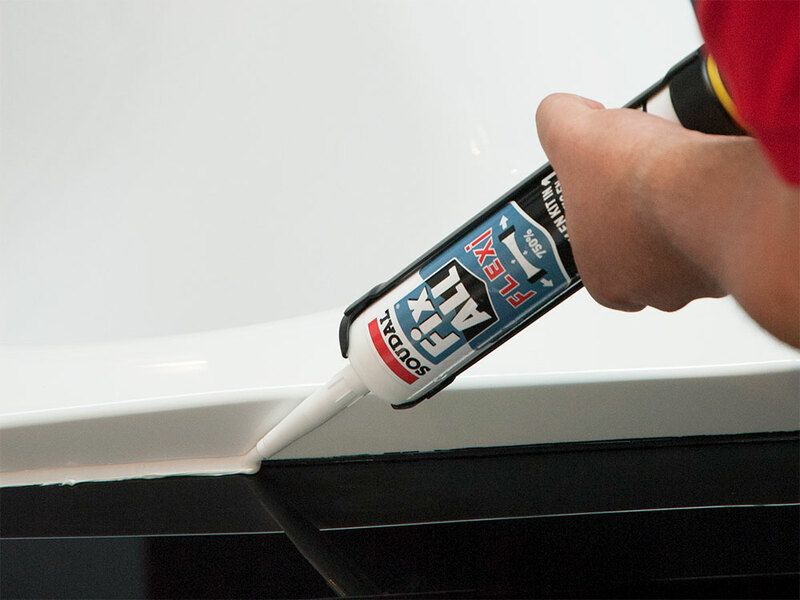 Wherever a silicone sealant can be used, a hybrid polymer can be used too. Wherever an acrylic can be used, a hybrid polymer can, too (it is also paintable). Fix All Flexi is also anti-fungal and conforms to sanitary standards ISO 846, but it may still grow mould after a long time. When you want to reseal, it is much harder to remove old Fix All because of its adhesive strength. Fix All hybrid polymers do not have the same matte appearance as acrylics, which means it may not match your wall as nicely. In most cases, we’d still recommend the traditional choices so you can save the money. Where hybrid polymer sealants excel is in difficult and troublesome applications, such as on an alway-wet surface, or even underwater. They also work well in imperfect conditions, such as on a surface with old residual sealant layer that cannot be removed. Their high adhesive strength makes them a good candidate for permanently sealing leaks, for example, in roofs. In most new renovations, it is usually not necessary as a sealant. As repairs, they may be a good choice. As an adhesive, though, hybrid polymers are superb products that should be considered over traditional construction adhesives, but that is for another guide for another day. How a contractor applies sealants is usually beyond your control, but you should insist that they do it nicely. As a rule, insist that they use masking tape to protect the adjacent areas of the seal, so that after removing the tapes, you will have a nice, neat line. You can also view this video by Soudal on best practices for bathroom/kitchen sealing. This is the work of somebody who thinks he is good enough, and is almost good enough, but really isn’t. Without taking that extra step of putting masking tape beforehand, you end up with a sealant that is not in a straight line, has unevenness throughout the sealant body, and has residual layers on the wall. Unfortunately, this is a very common sight. If you get such workmanship, most contractors will tell you that this is acceptable and that there’s no way to make it perfect, plus it’s a lot of work to reseal it. Most-times, homeowners will just say “okay lah” and then have to live with it. Instead of that, it’s better to specify your standards beforehand, and to let them know your expectation. Feel free to show them the photos in this post. While sealants represent a very small fraction of cost in any renovation, it still is a very significant part due to its visibility. Just in the bathroom alone, you’re likely to see your bathroom sink sealant at least twice a day – while brushing your teeth. It therefore makes sense for homeowners to ensure that they get the best sealants and highest quality products – especially since sealants are so cheap – less than $5 a cartridge! We urge homeowners with upcoming renovations to take that 5 minutes to discuss the sealants with your contractors and designers. Don’t let them use just any product – insist and specify that they use a product that you’re comfortable with, and that you trust. To learn more about our made-in-Singapore Pereseal products, you can check out our Pereseal.com site. Your contractor or ID can contact us here about using our products. Our focus has always been in the supply to large construction projects (see our project reference list here), which is why you may not have seen our brand before in your neighbourhood hardware shop. Still, don’t let that stop you from using our products in your own home. You can get in touch with us directly, or have your contractor or interior designer speak with us.